Crypto Giant members together with the founder of Under Twenty Mathematicians programme, Professor Jean Lubuma participated in Mathematics awareness initiative that target high school Learners. The aim of the project is to identify schools where there is a lack of information about tertiary education opportunities and careers in Mathematics, and to identify the learners which they can groom into pursuing a career in Mathematical Sciences. In 2014, the group saw a need to pay it forward since they’d gained much from others. Thus they started tutoring classes for calculus and linear algebra to first year students every Saturday morning. This is where they identified the gap that existed between high school mathematics and first year mathematics. Some students struggled with problem solving approaches, others weren’t even sure why they were there and most concerning was the deteriorating love of Mathematics. Some members of the group also identified with the struggles that the students were facing. The implementation phase of the project kicked off on 20 February 2015 in Soshanguve with the matric candidates of Reitumetse High School. 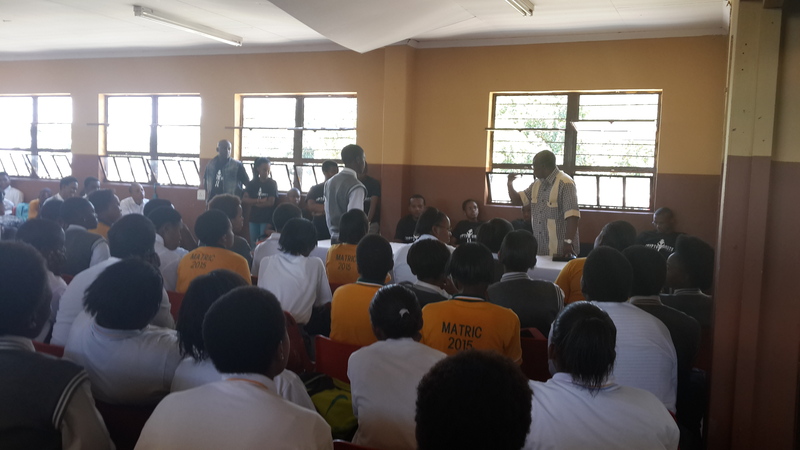 On 21 February, the team hosted grade 9-12 learners of Future Comprehensive School from Limpopo. We are excited for this project and cannot wait to see the impact it will have on the lives we come across. “Be the change you want to see in the world” ~ Mahatma Gandhi . Crypto Giants is a group of young, enthusiastic, diverse and mathematically-minded individuals who are passionate about the complex properties of numbers as well as Mathematics as a whole and its application in daily life. They are embarking on a problem-solving journey by tackling various mathematical problems and research projects, which will help them to enhance their mathematical skills and analytical thinking processes, thus discovering different approaches to problems at hand. They strive to learn more from the experts whom are willing to impart their knowledge to them concerning their different (research) fields. The field of mathematics covered in these projects are the following: Elementary number theory, basic analysis, creative mathematics and logic and set theory. The applications of the above fields are found in Cryptography(RSA) and Mathematical optics. Students are challenged to understand the basic theory of mathematics and applying it in physics, biology, finance and computer science for example. The students challenged to solve Cryptography problems using Mathematica and Matlab, and to write their report using latex. They are also challenged to solve logic puzzles and discussions about logical fallacies forms part of the program. Fuzzy-logical problem-solving through lateral thinking is a structured session as well. The program is structured to prepare students for honours level mathematics, and they are expected to present their literature review to the group and come up with their own examples where applicable. A great initiative! Many thanks for letting us know about this. We would love to see how it goes, so keep us up to date!